Magic Place Guest House v Řím, Itálie: Zarezervujte nyní! 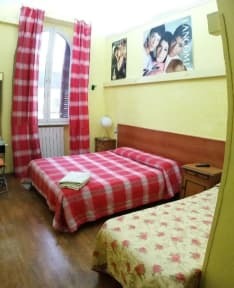 A beautiful very central located apartment with 5 en-suite rooms (private WC) with all the amenities that you need to have a great holiday in Rome. Get up in the morning and and have a free available buffet of typical italian breakfast, with milk,vegan soya drink,coffee, tea,fresh orange squeeze,croissant, plumcakes ,tartine ,biscottate slices,bread toasted ,cornflakes,marmalade jam ,butter, and Nutella chocolate cream. Breakfast is free buffet self service from 7.00 to 10.00 AM .Magic Place Guest House is 2 blocks off the main Station Termini, 10 minutes from all the main attractions, like the Colloseum, Piazza Venezia, TREVI Fountain, Spanish Steps and the Pantheon. ,through emails or last day by phone call or whats app that are more immediate and complete ,and please call us our numbers at your late arrival because the ring buzzer may be off. For check-in afterhours ,please deal it with us,when we can do it,there is a small supplement 10 euros per person for the service reception afterhours. "Extra charge 5 euros per person for mandatory linen and towel bath service valid for a stay of 1 up to 5 days"
Payment upon arrival by cash, credit cards. (This property may pre-authorise your card before arrival). Please bear in mind that if a property cannot pre authorise your card for any reason, they will email you to ask you for further details. Should they not receive a response from you within 48 Hours they would be then entitled to cancel your reservation due to insufficient card details. Breakfast included free self service from 7.00 feom 10.00 AM. No curfew.We give you the doors keys.